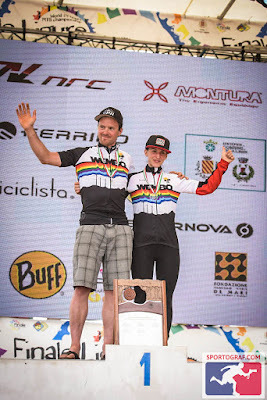 Andy 'Crasher' Howett: Probabilmente La Gara Più Difficile Che Abbia Mai Fatto! I am not a quitter. However, on lap five, sitting in a hedge bleeding quietly to myself I thought that it might be time to change this. It would be a short hobble from my bush back to the pits, a comfy chair and a beer to cry into. Everything which could have gone wrong prior to the race had. I usually make excuses about being unprepared but I had excelled myself this time. Having not even ridden a mountain bike since the British Championships at Relentless back in October was the least of my worries and the whole saga with the tyres didn’t even feature. I was supposed to have set off on the long drive from Edinburgh to Finale on Friday but after spending much of the preceding Wednesday at a hospital bedside in Melrose I then spent most of Friday, all of Friday night and much of Saturday there again. I won’t go into details but all concerned are now fine. I hung around until the last possible moment, late on Wednesday evening, just in case before jumping on a last minute flight to Nice with a bike, no pit crew and no real idea what I was doing. I had put out a slightly panicky appeal for help the day before and was overwhelmed by the kindness of my fellow riders and their helpers. Rivalries to one side they are a fantastic bunch when the chips are down, it really is the people that keep me coming back for more in this daft sport of ours. Sarah Jones stepped in as my pit crew and volunteered Jon Fearne to help her out. Steve Day, the defending singlespeed World Champion, brought me a spare bike since I could only get one on the plane and his brother Mark somehow got roped in as my mechanic. Ant White from Mt Zoom brought me a sleeping bag and was just generally lovely all weekend, even offering me another spare bike. Julian Prathitis, who I don’t think I had even met before, dragged a load of supplies all the way from Surrey for me. I had so many offers of help that I was turning people down, a massive, massive thank-you to you all. I landed at the airport in Nice late on Wednesday and said hello to Naomi, Gill and Graham at the oversize baggage reclaim, it seems I wasn’t the only one cutting it fine, and then went to find my hire car. Nearly two hours later I finally hit the road, missed the motorway entrance and drove several laps of the city before spotting a sign for Monaco and finally getting on the right route. 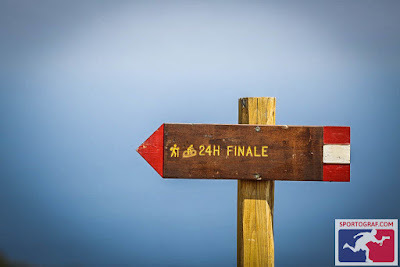 It was 2:30am when I wound my way up the twisty little road from Finale Ligure towards the race track, mercifully devoid of the usual suicidal moped riders at that time of night. I pulled up under some trees, put the passenger seat as flat as it would go, which wasn’t very with a large bike box behind it, and tried to get some sleep, waking again at 5:30am as a cat danced on the roof and then thought that it would be fun to play with the rear wiper. I got another couple of hours sleep before deciding that that traffic coming up the hill to the venue would not let me get any more. I spent the morning in town, stocking up on as much food and drink as I could reasonably carry, before returning to the track. Signing-on takes forever, as well as the usual Italian admin to overcome there were a lot of familiar faces to say hello to; Carolina and Marcel, Rachel, Pedro, Tina, Ricardo, Russ, Paul, Ben, it’s a shame we can’t all meet up more often. I then put my bike together, something else which is needlessly complicated. Most people can just pop the seatpost out to get theirs into a box but mine has an ISP and so I have to take the forks out instead. Finally, at about 5pm I could go out for a lap. There had been some discussion in the pits as to where the lap actually went, everyone who had been out for a practice was talking about a slightly different course and the differing GPS readouts backed this up. This was my fourth trip to Finale so I am familiar with the area, but which bits they would or wouldn’t use for the race were a complete mystery to me. I did what I thought was the right lap, but I guess everyone had done that, made sure the bike was working and called it a day. I made myself some dinner and then set about the last minute preparations for the race, mixing the innumerable bottles of Torq, attaching the numbers to the bikes, that sort of thing, realising a little too late that in amongst the hard boiled eggs I had just prepared were the ones I was intending to scramble for the all-important pre-race breakfast. Steve and Jon set their alarms for 6am, I have no idea why. The race didn’t start until 10. Given my lack of sleep in the run up to the event I needed every minute I could get and set mine for 8, all I really had to do was get dressed and have some breakfast. Remarkably, considering how uncomfortable the front seat of a small Nissan hatchback is compared to the lovely big bed in the back of my van, and the fact that there was a Black Sabbath cover being played at full chat 100 yards away as I tried to nod off, I slept right through until Matt and Sarah arrived at 7:50. The race briefing began at 8am but I could hear it from our pit over the sound system. The only change of note was that us singlespeeders had been upgraded to the Elite start, we would begin at 10am, with a ten minute head-start over the age-group racers. At 9:40 Jon was going round wishing Matt, Steve, the other Steve, Naomi, Iwona and anyone else he could find good luck for the race and me good luck for getting changed and to the start line in time. He does fuss so, I made it with well over three minutes to spare, and somehow managed to get a spot on the front row, former European Champion Elena Novikova to my right and defending (and seven times!) World Champion Jason English to my left. In the best tradition of 24hr racing this was a Le Mans style running start, the bikes all racked up in the paddock off to the side of the arena, this bit should suit me nicely. The crowds were quite unlike those one sees at races in the UK, both in terms of size and enthusiasm. As the countdown began they parted, not so much like Moses parting the Red Sea, which I always imagine as a grand and stately affair, but more like the spectators at a 1980s Group B rally, diving for cover at the last possible minute. …..two, one, Vai, Vai, Vai! The race was on. Someone over to my left launched himself off the line and sprinted for the first corner, I took off after him around the arena and up the wooden ramp by the stage. It turns out that wooden ramps are surprisingly tricky to run up in carbon-soled bike shoes with small metal plates screwed on to the bottom… Actually, running in riding shoes makes everyone look quite camp, someone once described it as moving like a duck with a full nappy. Around the pits I lost a place, and then one more as we came out of the pits on to the bottom of the famous toboggan section, down to fourth. I could hear an Aussie accent behind me, turns out I was ahead of Jason English. I took a place back as we sped along the field passed our pits, Sarah cheering me on and looking quite surprised to see me holding third place. The run was longer than I had expected but the longer the better for me. Up through the vineyard and then back into the arena passed the crowds to where the bikes were waiting, grab mine, up the ramp by the stage, much easier with rubber tyres than silly shoes, and into a huge crowd of people. Bugger. I had checked the clock as we had left the arena, 5m17s. I had thought that we would have a ten minute head start over the age group riders but this clearly hadn’t been the case and now here I was trying to fight my way through them, Josh Toscado and Jason English right behind me. We eventually branched off and on to the race track proper where it turned out that although I could beat the big names on foot I was no match for them on a bike, especially one with only one gear, and I yielded my place to two of the favourites in consecutive corners. I spent the rest of the first lap slowly working my way backwards down the field of geared riders. 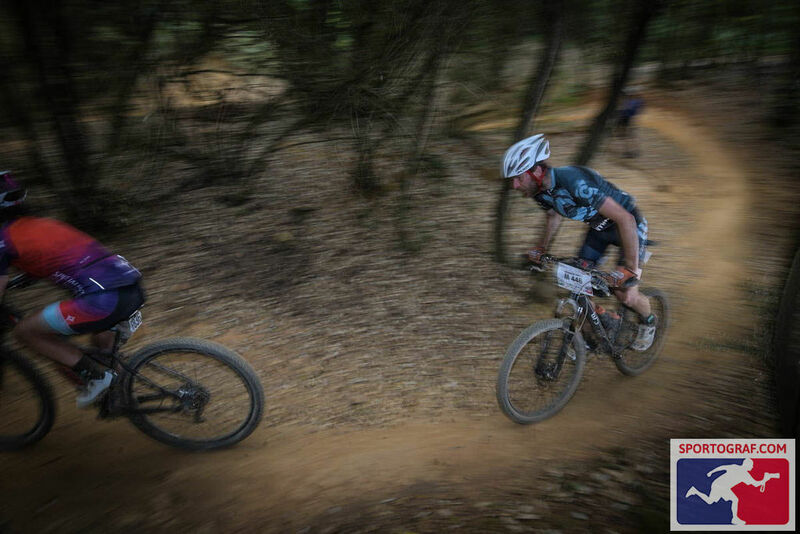 Steve Day then caught me on the fast fire-road section and just disappeared off into the distance, Wim Verheyen came passed me on the big climb before the toboggan. 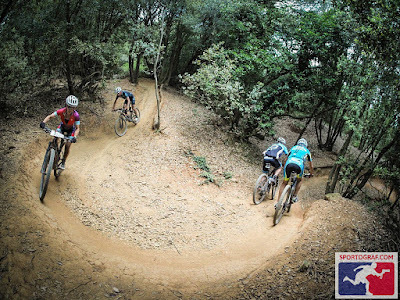 This put me down to third in the singlespeed category. I lost two more places to singlespeeders on the next lap. Fifth. This was not going well. 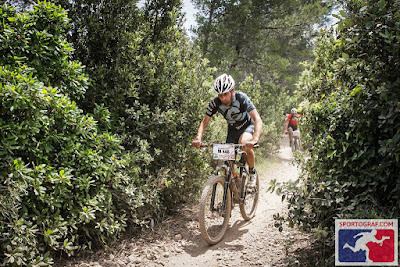 I was however enjoying the course, it’s great fun to ride fast and the support from the locals is brilliant. After three or four laps I was starting to suffer though, not good this early into a race. Normally the heat doesn’t really bother me but here it did for some reason. My feet had swollen in my shoes as a result and were agony, putting any sort of pressure on the pedals hurt like hell and the vibrations on the downhills where I could stop pedalling were even worse. My head was aching like crazy, the first sign of dehydration. I was drinking a bottle a lap and swigging more in the pits every time I passed through but it wasn’t enough, I was losing fluids faster than I could replenish them. Across the line to start lap five, up the wooden ramp by the stage, passed Mike and Keith’s pit, passed Rachel’s pit, a little left-right flick, down through the roots, drop down to the left, a quick burst of speed then brake for the right hander, the back tyre was feeling a bit squirmy, up into the top field to loop passed the pits again, there is definitely something wrong with that rear wheel. I stopped and squeezed the tyre, it was way too soft. Bugger. I leapt off, lifted the bike over the tape and off the course and flipped it over. I was 40 yards from Rachel’s pit, I was shouting for Ant as I pulled the wheel out but he wouldn’t hear me over the noise of the party in the main arena. I pulled the tyre from the rim, removed the offending thorn, stuffed a new tube in and attached my gas canister. The blast of compressed air blew the tyre bead clean off the rim. Oh, for $%£@'s sake! I snatched up the wheel and ran across the field towards Rachel’s pit shouting for Ant again. Oliver appeared looking slightly bemused, took one look at me running towards him and ducked back into their pit emerging again seconds later with a large track pump, sprinting towards me and asking what tyre pressures I was using. He was pumping as I shoved my tyre levers and the dead tube back into my pocket. I put the newly inflated wheel back into the bike, righted it, lifted it over the tape back onto the track and set off again, Oliver shouting encouragement behind me. This little episode had cost me over seven minutes, I had time to make up. It had at least afforded me the opportunity to catch my breath and so I was able to take the next section pretty fast, twisting through the tress, back out onto the fireroad, taking the opportunity of a smoother section to get a Torq gel and half a bottle down, right at the other vineyard, watch the pointy rocks on the drops, carry the speed along the cliff-top path, sharp left at the end, give it full beans to get up the hill, right at the top into the woods, swooping down between the trees, right, left, down the little drop, a quick burst of speed towards the left hander and aaarrrgh!!! I hit the ground, hard, sliding sideways on the loose stones, removing all the skin from my left knee, hip and elbow. The end of my brand-spanking new Mt Zoom Ultralight handlebar dug deep into the ground, flipping the bike over, off the trail and into the undergrowth. I looked up to see two riders bearing down on me, braking hard to avoid me, their rear wheels kicking up huge clouds of dust. They both shouted to ask if I was OK. Having not really had time to assess this I guessed and replied that I was so they left me to it. As the pain in my knee subsided slightly I pulled myself to my feet and got off the course. I sat down in the hedge next my bike and waited to get my breath back, looking at the blood coming out of my knee and running down my shin, I could feel some more on my forearm and elbow but didn’t really want to look. My bike on the other hand was had come out of it pretty well, a sub-120gram carbon bar had taken the brunt of the impact and was still absolutely fine. Maybe the old adage is wrong, light, strong and reasonably-priced as they nearly say. The emotional stress of everything which had happened prior to leaving the UK, the days of manic rushing around, the recent lack of sleep thanks to hospital chairs, car seats and cats, the dehydration, and now the pain and bleeding. I should just call it a day before I really do myself some harm. I eventually got back on the bike and set off, a nice, safe, steady pace, just finish this lap and it will all be over, I can go home. I arrived back at the pits covered in dust and a little blood. “I’ve punctured and crashed” I said, more as an explanation of my lateness and dishevelled state than a request for sympathy, although some would have been nice. Jon and Sarah could see that all of my limbs were still firmly attached and that the bleeding had pretty much stopped so they attached a new tube to my stem with the handy Mt Zoom strap thingy , put a new gas in my pocket, a new bottle of Torq on my bike, a banana down my throat and pushed me out again. I had no idea how much time this little episode had cost me though. I knew I had lost seven minutes with the puncture but the crash could have cost one minute or ten minutes, it’s amazing how one’s perception of time can change in situations like that (The results say that the puncture and the crash together cost twelve minutes - Ed) I also had no idea how this loss of time translated into loss of places. The timing system which we were using consisted of little chips we all wore on our ankles and mats with sensors in dotted around the racetrack. These were brilliant at keeping track of our progress, taking our times to within a fraction of a second several times a lap. It was however much less good at displaying this information to anyone who was interested in seeing it. I have just stopped and read back what I have written so far and it does sound awfully negative doesn’t it? 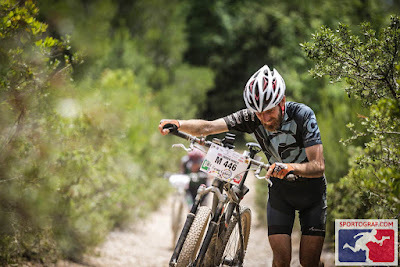 This really isn’t intentional, whatever personal issues I may have been having Finale remains one of my favourite races – the course is fantastic, if somewhat brutal on a singlespeed, the atmosphere is like nothing else and the people are all lovely. Yes it’s a bit chaotic at times, most of the time in fact, but I can live with that, I love it. Anyway, back to my race and things were starting to improve, After about 3pm the temperature fell a little, down below 30c, I was finally able to combat the dehydration and my feet were returning to a normal size. After a couple more laps even my knee was functioning properly again and I was able to pick the pace up somewhat. This is a course which just gets more and more fun the faster you ride it. I was going fairly quickly but not taking any risks, just putting in surprisingly consistent lap times and having some fun. 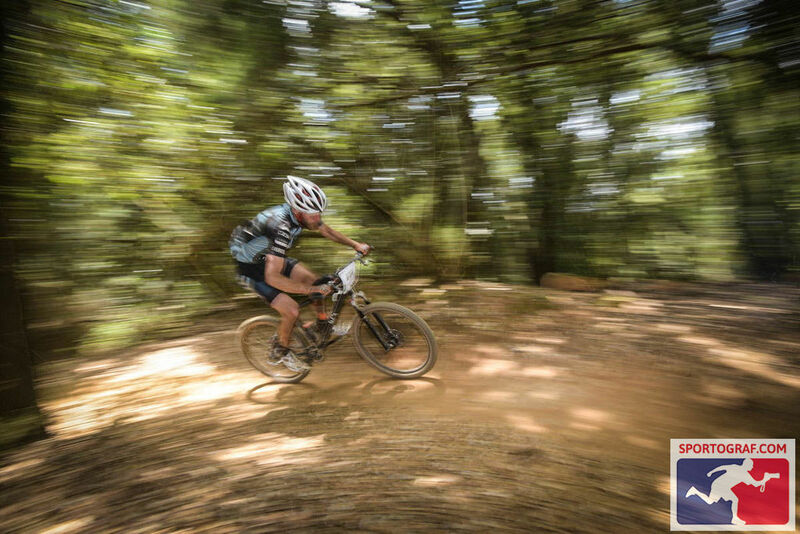 I hadn’t seen any singlespeeders for a while but I was enjoying racing the geared riders, I could keep up in the techy sections and was even passing a few of them on the climbs but was loosing out on the long fireroad where top speed was more of an issue. Really? After all that had happened I was only twenty minutes off a potential World Championship podium. Right, I’m having this! I described the guy I thought was third so that they could keep an eye out for him, a yellowy orange singlespeed with a lefty, black shorts and a white top with Finale Borgo written on it. I didn’t describe fourth, it was third I was interested in. With a renewed sense of purpose I kept my speed up and my lap times down during the night. Unusually I was trying not to use any caffeine, just the one caffeinated gel in the whole race. Whilst I think using it may have been a short-term benefit during the night it wouldn’t help with the dehydration issue once the temperatures started to pick up again. 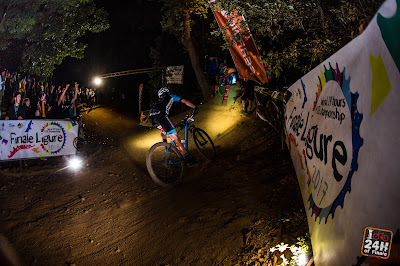 I pitted again at about 1am, needing to swap my Exposure MaxxD out for the Toro, just the two lights easily had sufficient power and battery life to see me through the whole race, although I was carrying the little Joystick on my helmet just in case. It was reported to me that the guy who had been in third four hours previously was now almost exactly half a lap away from me. “Who’s in front?” I asked, wondering if he was half a lap ahead or half a lap behind. Not sure whether I was chasing or being chased I ate yet another banana and headed out again. I got through eleven bananas in the first sixteen hours of the race, along with a bottle and a Torq gel every lap and the occasional Torq bar, Mars bar, rice pudding and hard-boiled egg, and only stopped eating bananas when we ran out. I had brought nine, which really wasn’t enough. Long after I had eaten the last one Mark managed to acquire two more from somewhere in the middle of the night and made my favourite race treat of a Nutella-covered tortilla wrapped around a banana, which was a very welcome surprise. climb and was taken just after 7pm, so nine hours into the race. Usually in a 24hr race the course goes very quiet over night, all the casual spectators get cold and drift off back to their beds, it’s just the racers and a few hardy marshals out on the hillsides. Finale is a bit different. When the bands stop playing on the main stage in the arena the attention moves to the bottom of the toboggan section where a DJ and a set of disco lights appear, along with a rather raucous crowd, cheering anyone who rides up the banking towards them or even hints at lifting a wheel off the ground but who have also been known to boo anyone taking the fast line along the bottom and not making any effort at showboating. The only crowd I have ever seen like it in the UK was at the Cheese Rolling, probably the scariest sport I have partaken in, with the possible exception of hockey. Anyway, back to the race. It was an excitingly close contest for first place between Canadian Cory Wallace and the defending champion, Australian Jason English, the lead appeared to have changed hands several times and I had no idea who was holding it at any given moment. 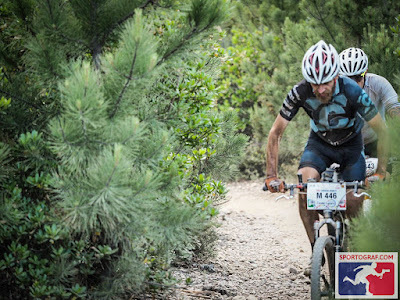 Steve Day was going very well, dominating the singlespeeds and not far off the overall lead despite only having one gear and fellow Brits Carwyn Davies, Peter Nadin, Max Suttie and Nigel Smith were also up at the front playing with the big boys. 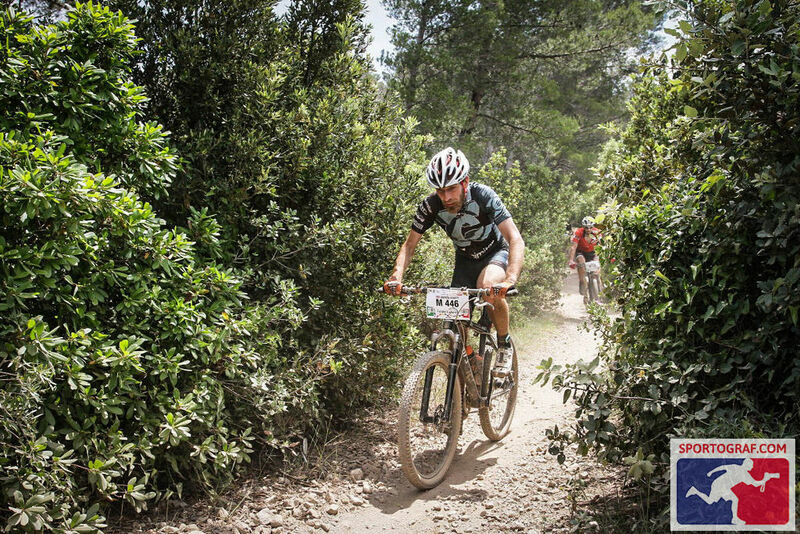 The Brits were mostly going well, although Naomi Friereich who was camped next to me was out, a combination of a foot injury, punctures, crashes and a general loss of the will to live. Matt Jones was also suffering but seemed determined to make it to the end. I had seen Rachel Sokal out on the course a couple of times and she was going very rapidly, chasing down Iwona Szmyd (who is Polish but as she is both very fast and a British resident we are going to claim her) for the position of Top Brit and maybe even a podium in the women’s race, Gillian Stewart was not far behind and looking strong and was having a good scrap with Donna Waring. I had no idea what Keith Forsyth was up to, I saw him by the side of the track at about 4pm suffering from dehydration and maybe a bit of heatstroke and then a short while later in the pits having thrown in the towel. However, he then appeared to get the towel out again, as I next saw him a few hours later as he charged passed me up the tricky loose climb, putting in a few quick laps before retiring from the race once more. Actually, I think he may have retired from it twice more, I was losing track of who was where. At the end of the next lap I noticed that Jon had some chips, he saw me looking at them and offered me one. What I really wanted was salt, Sarah produced some out of thin air, covered his chips with them and passed them to me. I ate almost all of them, apologised briefly and headed out again. I was surprising myself with how well I was going throughout the night. 24hr racers are a strange bunch of people. Every single person taking part in the race was doing something which most ‘normal’ people would not even contemplate and yet they all seem to regard us singlespeeders as a bit weird, I don’t know why. This was my fourteenth 24hr race, my third on a singlespeed and I can honestly say that they are nowhere near as bad as those who haven’t tried them appear to perceive them to be, having just the one gear really forces me to pace myself and this consistency appeared to be paying off, I still felt fast even this far into the race. 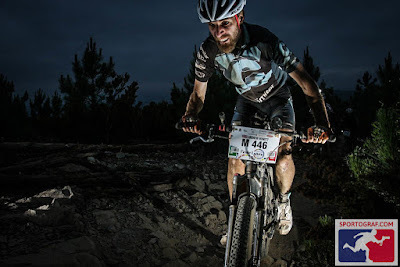 Fourteen 24hr races might seem a lot, it feels like it anyway, eighteen if you count two team events and two 24hr time-trials, but there was an Italian guy camped near us who was doing his one hundredth! This included every race there had ever been at Finale, all eighteen of them, and up to nine in one year, I once did three in a year and that was plenty, doing nine must have left him in an almost perpetual state of jet-lag! I can’t remember his name but it was a very impressive tally. I’m digressing again aren’t I? I’ll get back to the race. I forget exactly what time it was but it was still dark, 4am at a guess, I was in the pits eating some tinned peaches, a poor substitute for a banana but it was all we had, when someone came bounding in with news that Steve had crashed pretty badly and was on his way in. I finished my food as quickly as I possibly could and then did the most helpful thing I could do, which was just to go, I was practically pushed out to make way for him. I just saw him arriving as I left, he was covered in dust and riding looked painful. His helmet light was hanging off, flapping around by his shoulder, not a good sign, he had obviously hit his head quite hard on something. I found out later that it had been hard enough to break his helmet (In Jason's video above it was at the spot at 19:05). I thought it would be race over for him so I was quite surprised when I next came through the pits that he wasn’t there but had instead gone out for another lap. 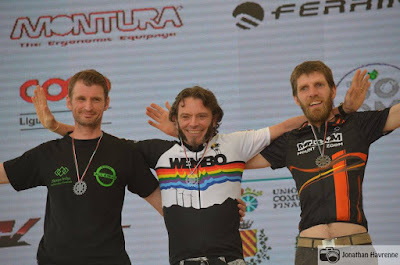 His race plan had changed from going for an overall position to just trying to keep the lead in the singlespeed category, he was quite a way ahead of Wim Verheyn but there were still a good few hours left so he had to keep putting in as many laps as he could. Some more up to date results had been found and these confirmed that I was now in third. They gave no indication of the timings through, we had no idea if I was a safe third, nearly second or about to be fourth. This must have been worse for Steve, he was still leading the singlespeeds by doing a lap, stopping, stretching, recovering a little, and then doing another lap, but no-one was quite sure how long he had to keep this up for to be able to stay ahead or when he could just sit down in the pits and wait for the 24hrs to tick over before crossing the line again. down once. To be fair though, I felt just as broken as he looks! The fact that the race had started early, 10am, meant that the time between it getting light and the finish was unusually short, which was actually rather pleasant, I think I preferred it this way round. The 10am start was presumably introduced to give a much bigger gap between the World Championship and the 24hrs of Finale team race, which would start at 3pm on the Saturday. It appeared however that no-one had told Josh Toscado about the start time, he arrived at the venue at 9:30 expecting a more normal midday start and was surprised to find everyone ready to go (Yes Jon, everyone apart from me, I know) He somehow got himself on the start line in time and then had a pit ready and waiting for him by the end of the first lap, where he had to stop to collect his timing chip. The final few laps all passed in a bit of blur for me. I recall a brief chat with Peter Nadin as he came passed me en route to winning the ‘Old Enough to Know Better’ age group, he was still looking very strong even that far into the race. 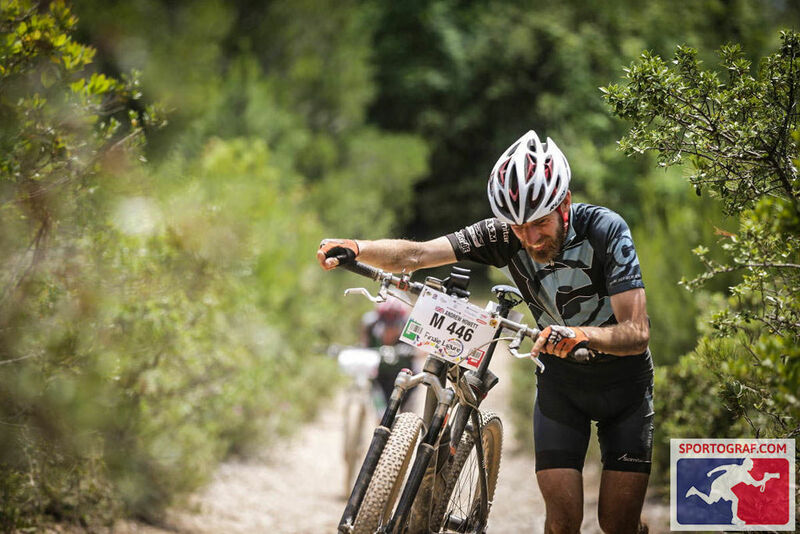 Everyone is really friendly in these races and always has time to say hello and a few words of encouragement. At 22hrs56min I crossed the line again, heading out for what I was sure would be my penultimate lap. As far as we knew I was still third but I wasn’t going to assess the quantity of any poultry just yet. I was passed at the top of the big climb by a rider in a blue top. This was nothing unusual, the geared riders often passed me here. The rocky part at the bottom of this climb was the only bit where the singlespeed felt like it was a liability, where I had to get off and push. On occasion I also had to push the final section at the top of the climb and sometimes also the loose climb earlier in the lap, but this was mainly in the wee small hours. Even when I could ride the top section of the big climb the effort would mean that I would have to back off and recover at the top, riding slowly for a short while to get my breath back and this was where I was passed on this occasion. Looking like I felt. Don't stop, just keep moving. I didn’t recognise the rider in the blue. I looked down at his bike as he came by. He had only one gear. This was not good news. The number on the back of his bike was 224. This was odd, the singlespeeders all had numbers over 440, this was an age-group number. He was remarkably clean and fresh-looking, which was also odd. What was going on? I didn’t recognise him as either of the two guys I thought I was racing. Was he an age-gouper out on a spare bike? If he had done any laps on a geared bike earlier in the race he would not count as a singlespeeder and this wouldn’t be a problem. Had he changed categories after the numbers were allocated? If this was the case then had I just lost a place or was he merely unlapping himself? 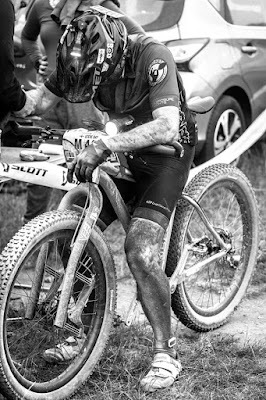 The fact that he looked relatively unscathed by twenty-three hours of racing indicated that he may have stopped at some point and probably was just unlapping himself, making up some of the ground he had lost earlier. The most likely scenario however was that I was over twenty-three hours worth of tired and that this was playing havoc with my thinking abilities, I was putting far to much effort into trying to work out what was going on, and was not doing very well at it. Chances are it was just a bad case of paranoia but maybe I had just lost a World Championship podium. With the results appearing so sporadically there was no way of knowing. I had to stay with 224. More than that, I had to beat him. I followed him down the narrow cliff-top track, as fast as I dare, the track was rough at first but then smoother, it wasn’t too difficult but there was one hell of a drop down the cliff to my right. A rocky gully crossed the track just as it turned slightly uphill, I crossed this, still on his tail. I had never got this section wrong but the precipice to the side made it look rather intimidating and I breathed a sigh of relief every time I crossed it successfully. He started to pull away from me as the track climbed up, it widened after the hairpin and he opened up a bit of a gap as we climbed towards the top of the toboggan. Swooping down through the trees I closed the gap again and got myself back onto his wheel. I made a mental note of this. He could climb quicker than me but I had the edge on this final descent, if it came down to a sprint finish at the end of the next lap I had to get into this section ahead of him. The crowd at the bottom had started to melt away, heading over to the arena ready to watch the finish. Charging through the pits I saw 224 stop at his tent to refuel. I decided to roll the dice. I had a spare bottle on the bike and one gel left in my pocket. Would this be enough to get around the final lap? If I didn’t stop for any anything else to eat I would gain probably a minute on him but I could easily loose much more than that if I ran out of energy, was it worth the risk? Sarah was waiting for me in the pits, more food and another bottle ready for me. I sailed straight passed her, shouting that I would explain later. I crossed the line again at 23hrs52min. I had no way of knowing how long 224 would stop for but I had to assume that it would be a short stop just to grab some food. If he was an age-grouper on his spare bike it was possible that he could be taking the opportunity to swap back to a now-repaired geared bike but I wasn’t going to rely on this. The lack of any live timing was working for me now. 224 was out of sight behind me as I headed out of the arena onto the track, he wouldn’t know if I had pitted or not, and the lack of live results would mean that when he crossed the line he would have no idea if I was ahead of or behind him. Since this would be my last lap there would be no point in pacing myself, there was nothing to save myself for. 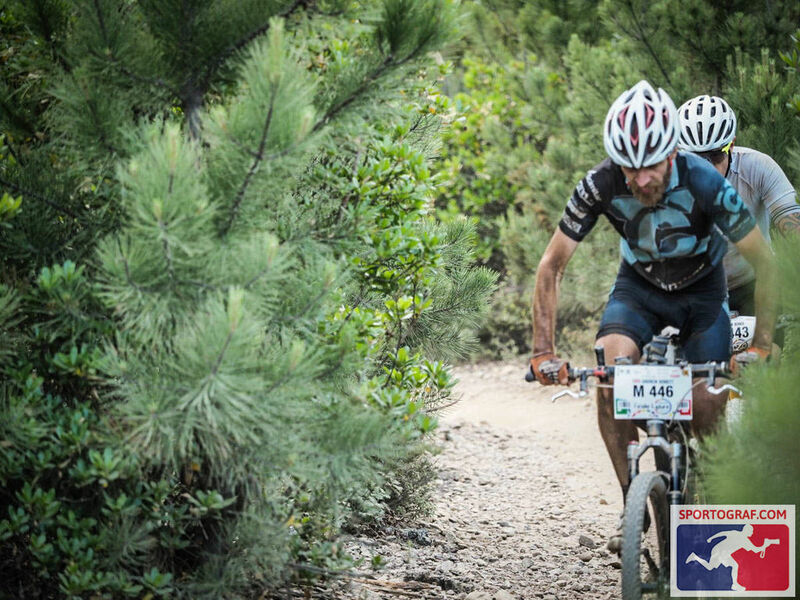 I was flat out, pushing as hard as I dare, but with my earlier crash in the back of my mind, don’t overdo it. Through the pits, around the woods, along the short fireroad to the vineyard, turn right and along the narrow path, still absolutely flat out, left at the end, along the lovely swoopy section. Up the loose climb, through the trees at the top and out on to the main fireroad. I was going as quickly as I could here although with only one gear my legs were spinning like crazy but I wasn’t really making much progress, I would be a sitting duck if my pursuer had a higher gear, in my sleep-deprived and paranoid state I spent more time looking behind me than I did looking forwards, I have never been so relieved to see a big climb looming at me. Up it one last time, along the cliff-top track, loop round back up to the top of the toboggan, and down into the trees, don’t crash, don’t crash, don’t crash, don’t throw it away now. I could hear Jason English being interviewed on the PA system but I couldn’t make out if he had won or not, whether he made it eight in a row or if Cory Wallace had finally achieved his goal and broken the Aussie’s dominance. Through the pits at the bottom, around the field passed our campsite, up into the arena and across the line. I thought I had done it, would the results back this up? 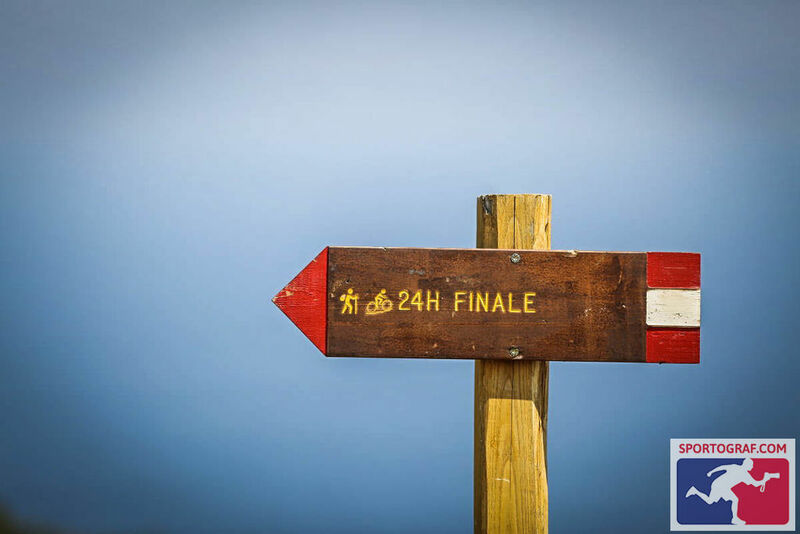 There were actually two finish lines – the first was were the timing system was located, in a little holding pen off to the side of the main arena. I forget the name of the guy standing at line itself, one of Ricardo’s many helpers, he was a lovely chap and had a word of congratulations for everyone who had made it to the end. There were a couple of other riders sprawled on the ground in various states of dishevelment and that was it, no-one else. Quiet. Peace. Calm. I took my helmet off, loosened my shoes, which I had been desperate to do for so long, and joined them, collapsing in heap. Ricardo appeared out of nowhere, said well done to everyone and gave us all a hug and then vanished again. This first finishing line was a great idea, it gave everyone time to compose themselves before facing the crowds. I had a few minutes to get my breath back, drain my bottle and wonder where I had finished before staggering back to my feet and limping towards the second finish line. The crowds were out in force here, lining both sides of the barriers, cheering and clapping everyone. Someone shoved a cold drink into my hand and I staggered out into the main arena, the whole place was stuffed full of people and a massive party appeared to be in full swing, I just needed somewhere to sit, preferably in the shade, but could see no empty space anywhere. Somehow Jon, Sarah and Mark spotted me in this throng and pushed their way through to me. They had results. We were all back in the arena a couple of hours later, fed and showered but still broken, the pit crews looking just as tired as the racers, only the funny walks of the riders setting them apart. The British contingent were the second largest national group after our Italian hosts and it reminded me very much of the Olympics, every time I looked up there was a Brit getting a medal for something! There is a full list of everyone from the British isles below. The biggest surprise for me was Mike Hancock, I had thought that he was here as Keith’s pit crew right up until the moment that he was announced as third in his age-group and appeared on the stage waving a large saltire. Being up on the stage was an amazing experience. It’s huge and the crowd down below was also huge. I was joined by Wim Verheyen and Steve Day, who had just managed to do enough to hold on and take the win despite his crash. Russ from WEMBO and Ricardo from the race organisers were presenting the medals and shaking hands, Ricardo somehow appeared to be the least tired looking person there, despite having been awake for about three days straight and with at least two more still to go. 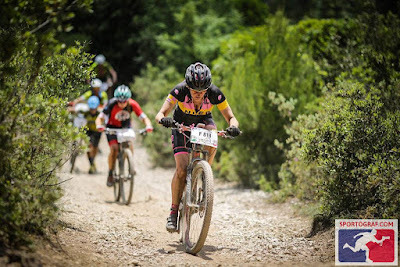 It was excitingly close in the Elite women’s race, Gaia Ravaloli won, the first Italian to do so and I think the first non-antipodean, it really was a home race for her too, not just her home country but only about 30 miles from her house. She beat the defending champion by a mere sixteen minutes! Cory Wallace finally won the men’s race just ahead of Jason English, I’ve lost count how many attempts he’s had but his persistence has finally paid off. There are a few contenders for my ‘ride of the race’, a lot of very strong performances, but I’m going to pick Steve Kelly. I didn’t see much of him during the race itself, although Claire was lovely, even helping out in our pit when she wasn’t looking after him and cheering everyone on. The first time I spoke to him was after the race as I was heading off for a shower and he was heading back to his pit from the finish. We had a brief chat and compared notes, he had finished seventh in his age-group and seemed pretty happy with that. Some time later I was heading down to the town for dinner with most of the other Brits and Jon was sending a text message. He mentioned that he was asking Steve how he was, I asked what had happened. He had broken a toe and cracked several ribs and maybe an elbow. I don’t know exactly when this happened but continuing to the finish with cracked ribs is pretty impressive, that must have hurt, and that’s what gets him my vote. He had apparently dealt with the problem by taking more than the recommended dose of painkillers and then just ignoring it. When I spoke to him after the race he hadn’t even mentioned it! Italy’s Ausilia Vistarini won the women’s singlespeed race from Cataluña’s Carolina Casacuberta. The Brits came away with quite a haul of medals. Carwyn Davies took the spot of Top-Brit in twelfth overall and the title for the Under-23 age group. 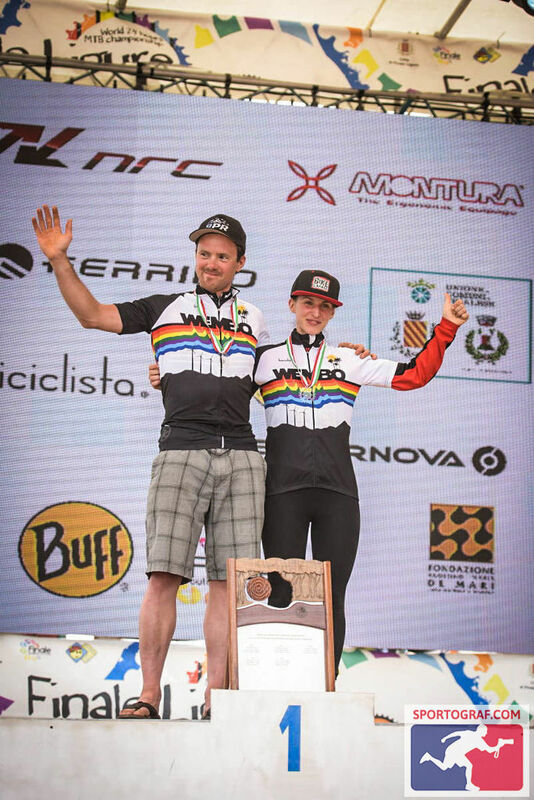 Peter Nadin, Max Suttie and Gillian Stewart all won their respective age-groups, which with Steve’s gold in the Singlespeeds made it five world champions! There was a silver for Nigel Smith in his age-group, only two places behind Carwyn in the overall standings, bronze for Mike Hancock in his and, as I may have mentioned previously, a bronze for me too in the Daft Bikes With One Gear category. Champions - Cory and Gaia. Finally, one last word from me. It is now fifteen years since I first said that I would like to race in a World Championship one day, seven years since I first did it and now I have a medal from one, I never expected that all those years ago. There are a lot of people I would like to say a huge thank-you to for all their help in getting here, people I really couldn’t have done it without. It’s much too long a list to mention everyone but you all know who you are. Thank-you all so, so much.